Adobe CS5.5 sees a mid-point release for Creative Suite for the first time. And although we're traditionally used to seeing 'point' releases such as this as free updates to current users, this is a paid-for upgrade. So for your £571 (if you're upgrading the entire Master Collection – it's £1,811 for a fresh CS Premium package) what do you get and is it good value? It depends on what you use it for. There is certainly a good amount of new features across the suite, but not all apps have new functionality. In fact, many are almost untouched, sporting only a few minor tweaks. So if you're expecting some new Photoshop bells and whistles, think again. Well, kind of. If you have an iPad and a copy of Photoshop, you can now use the three new Adobe iPad apps, Nav, Lava and Eazel, to control and send images to Photoshop Extended over a Wi-Fi connection. These three apps signify the release of the Photoshop Touch SDK, meaning anyone can create iPad apps that interact with Photoshop. Illustrator, the vector drawing app, also remains largely untouched, with a few new features such as brushes with corner controls and improvements across stroke and arrowhead functionality. Acrobat X Pro gets a guided Actions Wizard for automating multi-step PDF tasks (joining multiple PDFs, for instance). Where things do get interesting, though, are in the new 5.5 releases of Flash, Dreamweaver, After Effects, Premiere and InDesign. The latter, Adobe's page layout tool, now gains more eBook and digital publishing tools. 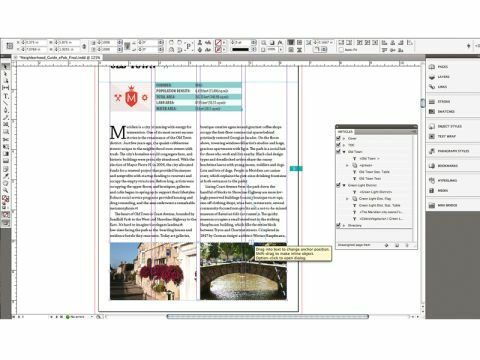 The ability to add a cover to EPUB formats directly from export and refined controls make it a much smoother process to create EPUB docs that display correctly across all platforms. Adobe's digital publishing tools have also been included – but you will need to pay a fee to actually publish iPad magazines and apps. The web and mobile tools are where this release comes into its own. Dreamweaver CS5.5 now enables you to author native mobile apps (and test them live on android platforms) and updates to Live View mode – along with enhancements to the Multiscreen Preview panel – make it quicker to preview your designs (the latter enabling you to see side-by-side renderings of a single design across multiple platforms). Flash CS5.5 is similarly impressive. Content scaling enables you to scale content on the Flash stage to adapt your design to different screen sizes (particularly important for developing android apps or games). New code snippets for creating mobile and AIR apps make use of accelerometer, multi-touch gestures and more. Adobe is really pushing mobile here – and if this is your area, the updates to Dreamweaver and Flash are a no-brainer, especially if you own the Web Premium version of CS. Video has also been concentrated on, with the CS5-introduced Mercury Playback Engine (for speeding up real-time rendering within After Effects and Premiere) offering support for more graphics cards. After Effects CS5.5, Adobe's compositing and VFX tool, sees a neat new Warp Stabilizer tool that really does work magic on shaky camera footage. Premiere Pro includes new trimming and editing tools along with new integration with the now Mac-compatible Adobe Audition. CS5.5 is a release you'll love if you're into mobile, video and eBook creation. If you're into design, illustration and photography, and have no interest in creating digital books and the like, you can almost certainly stay with CS5.